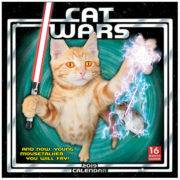 This is the 2019, 16 month wall calendar spoofing Star Wars: Cat Wars. A long time ago, in a galaxy not so far away . . . cats rule! A battle of good versus evil stretches to all corners of the galaxy! Whether the foe is mouse, dog or other feline, these kitty warriors attempt to vanquish all evil in the empire! The Cat Wars have begun, and the battle is coming to you! Don’t worry your whiskers though; we’re pretty sure that good triumphs over villainy. This is a mint, unused, original shrink wrapped copy stored in a smoke and pet free environment. 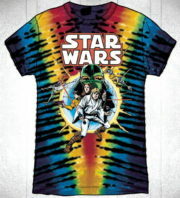 This is a multi color tie-dye t-shirt that features the art from the cover of the first Star Wars comic by Marvel in 1977, underneath the Star Wars name logo. This is a new, unused, 100% cotton t-shirt. 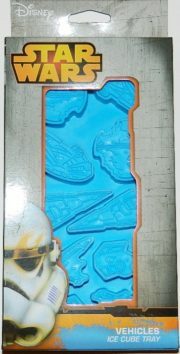 Now from you galaxy far, far away direct to your freezer comes this special edition collector’s package containing a rubber ice cube tray featuring 10 cube slots of X-Wing Fighters, Tie Fighters, Imperial Star Destroyers, the Death Star and of course the Millenium Falcon! Produced by C and D this is an air freshener featuring the poster image of the classic Star Wars movie Episode IV: A New Hope. Produced in 2005 and no longer being made, it measures 3″ x 3″ and is new and unused and sealed in the original shrink wrap. 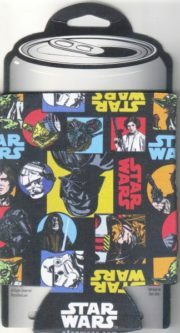 This is an illustrated insulated neoprene drink can cooler huggie featuring a collage of art images from the original classic Star Wars movies. This is part of the FUNKO line of POP! vinyl figures and this series features characters from the Star Wars movies, measuring 3.75″ high. This is a licensed Boba Fett blaster as seen in the classic Star Wars movies and produced by Rubies designed as a non-working costume toy. 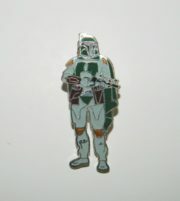 This is one of a series of licensed Star Wars pins and keychains produced by the Hollywood Pins Company in the early to mid 1990’s, and out of production since 1997. This is a near mint, unused copy of this cloisonne pin, measuring 1 3/8″ across. 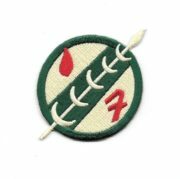 This mint, unused 2 1/2″ wide patch is the family logo of the most popular bounty hunter in science fiction, Boba Fett. A symbol of his family, it can be plainly seen on the his armor chest plate, as seen in the classic Star Wars movies. 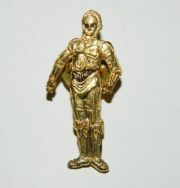 This is one of a series of licensed Star Wars pins and keychains produced by the Hollywood Pins Company in the early to mid 1990’s, and out of production since 1997. This is a near mint, unused copy of this cloisonne pin, measuring 1 7/8″ high. 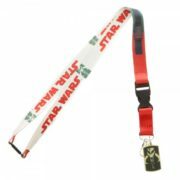 Produced by Bio World in 2016 is this 18″ long metal, cloth and plastic lanyard that is covered with the Mandalorian logo from the original classic Star Wars movies along with the Star Wars name logo. 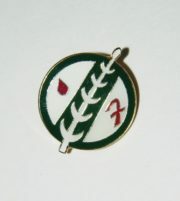 There is also a rubber charm at the bottom in the image of the Mandalorian logo. It can be used to hold keys, name tags, and more. This is a new and unused stoneware ceramic mug from the classic Star Wars movie series. 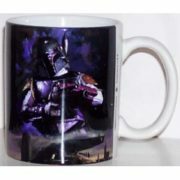 This mug features Boba Fett from Episode V, The Empire Strikes Back on both sides with the name Star Wars in large vertical open letters along the side. 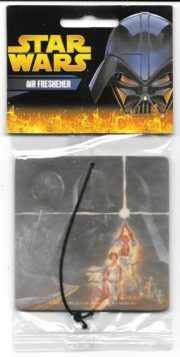 This is one of a series of licensed Star Wars pins and key chains produced by the Hollywood Pins Company in the early to mid 1990’s, and out of production since 1997. This is a near mint, unused copy of this cloisonne pin, measuring 1.5″ high. 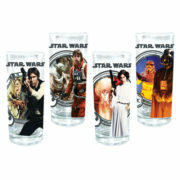 This is a clear 10 ounce drinking glass bearing the photo images of the classic Star Wars characters Luke, Han, Leia, Yoda, Chewie, R2D2, Vader and a Stormtrooper underneath the Star Wars name. They are new and unused glasses packed in an illustrated box. This is a 4″ x 4″ set of four coasters from the classic Star Wars movies. 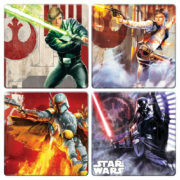 They feature the full-color art images of Luke, Han, Vader and Boba Fett. This is a clear 16 ounce drinking pint glass set of 4 bearing the photo images of the classic Star Wars characters Yoda, Darth Vader, Boba Fett and a Stormtrooper above their name with the classic Star Wars name logo on the back. 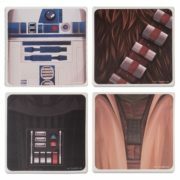 This is 4″ x 4″ set of four ceramic coasters featuring art chest images of R2-D2, Darth Vader, Chewbacca and Yoda from the classic Star Wars movies. Ceramic material absorbs condensation: Character designs with matte finish complements home decor: Grip footing keeps coasters in place. This is 4″ x 4″ set of four glass coasters featuring art images of a StormTrooper, R2-D2, Darth Vader and Boba Fett from the classic Star Wars movies. It comes with non-slip rubber feet to prevent scratching. 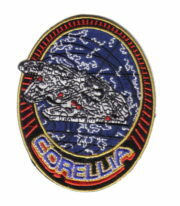 This mint patch, features the logo of the Corellia Freighter known as the Millennium Falcon, as seen in all three of the classic Star Wars movies. It was originally produced for the original Star Wars fan club, and measures 4″ high. 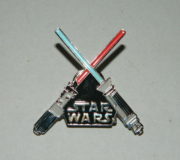 This is one of a series of licensed Star Wars pins and keychains produced by the Hollywood Pins Company in the early to mid 1990’s, and out of production since 1997. This is a near mint, unused copy of this cloisonne pin, measuring 1 1/2″ across. This is black bi-fold leather wallet featuring the image of the heads of Darth Vader, Boba Fett, Emperor Palpatine along with a Star Destroyer, Tie-Fighter, Death Star and a horde of Stormtroopers from the classic Star Wars movies on each side. It is a new, unused wallet, sealed in a plastic protector. 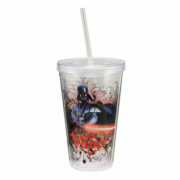 Produced in 2013 this is a 12 ounce clear acrylic travel cup that features the image of the classic villain Darth Vader along with the Star Wars name logo, from the classic Star Wars movies. It is a double wall 5.5″ high acrylic travel cup, comes with a straw and is BPA free. It is perfect for hydrating on the go, and the double wall keeps drinks cold! Hand wash recommended. Produced in 2012 this is an 18 ounce clear acrylic travel cup that features the image of the classic villain Darth Vader along with his name logo and the Star Wars name on the reverse, from the classic Star Wars movies. It is a double wall acrylic travel cup, comes with a straw and is BPA free. 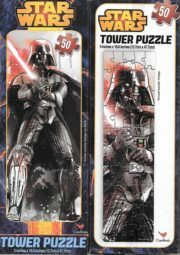 Produced in 2013, this is a new, unused, sealed tower puzzle featuring art work of everyone’s favorite villain Darth Vader as seen in the classic Star Wars movies.